Third Step Gel is a unique preparation formulated for maximum moisturizing capability. The Gel contains no preservatives and no water. It is so concentrated that only one ounce of Gel provides the same coverage as four to five ounces of ordinary water-based creams and lotions. Squalane, a form of refined Shark Liver Oil, is a natural component of human sebum. It is highly miscible (mixes intimately) with human sebum and penetrates well into human skin. It is a natural humectant (moisturizer) and emollient. Squalane is very stable and, unlike other oils, does not turn rancid when exposed to air. Third Step Gel contains a remarkable new fragrance. Some fragrances can be highly allergenic and can frequently cause skin problems such as redness, rashes, and itching. The low-allergenicity of the new Third Step Gel fragrance will not cause skin problems in the vast majority of people. Laboratory testing has shown that the fragrance is not irritating to the eye or skin and is non-toxic by ingestion. Third Step Gel is compatible with elastic pressure garment fabrics, as shown by extensive testing with burn patients. Repeated use of Third Step Gel will visibly improve the appearance of dry, flaky, cracked skin while providing soothing relief to irritations. To demonstrate the effectiveness of the Third Step Gel formula, we compared the rates of evaporation of five well-known moisturizing agents. Equal amounts of gel were spread onto paper discs. The discs were weighed at 15 minute intervals and the percentage weight loss for each was calculated. 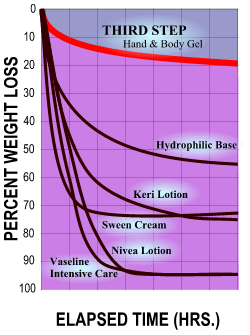 As shown in the graph below, the results verified the dramatic superiority of Third Step Gel. After only two to 3 hours, the other moisturizers were almost gone while almost all of the Gel remained after seven hours.